Yazi doji was a direct descendant of Lady Doji, the first lady of the crane clan. She was perfection, even according to Crane standards. During her duties for the clan she discovered a scorpion spy in her court and it amused her to give him false information without his realisation. What she had not expected though was that by dealing a lot with him she discovered that he was a fascinating person, who by his many talents, managed to remain unnoticed at the Crane household, apart from her. She developed deep feelings for him and could not bring it to unmask him. Yogo Nadashi, also known as "The Red Sting, master archer" knew he was discovered and had received useless information but failed to disappear and accept to take another command because he had become infatuated by Yazi Doji. Eventually their relationship led to a to pregnancy. The night that they would disappear together and live as ronin, they were caught by the brother of Yazi. Yogo Nadashi, who was a competent scorpion bushi, shot the crane samurai through his heart instead of trying to cope with the Crane duelist. He did this to save his life and that of Yazi, since he was a master of the bow and his legendary opponent an expert with the katana. They were not discovered and could escape to a monastery where Yazi gave birth Mistsurugi. Nadashi returned back to the burning sands to gather resources for his family. However, he was taken captive by the lion clan and since he was a spy, he was declared dead by the lions so they could torture and interrogate him. When Yuzi heard this, it broke the heart that was already very troubled by the death of her brother and her own dishonor in the whole affair. She threw herself from the battlements of the monastery. The monks gave Misturugi to a crane Kakita family who could not conceive children. The father was a warrior with great honor that very much wanted a son. An excuse was made uo so Mitsurugi could become the true heir of this family. Unfortunately for his new father, Mitsurugi was no warrior in the traditional sense of the word. He found art and etiquette much more interesting. To reassure his father somewhat, he trained his talents in ijaiutsu to become champion. Also in archery and athletics, he excelled. But his true passion lay in dance, music and storytelling. When he was 12 his foster mother gave birth to twins, unexpectedly and ironically they were the same type of men as his father. When it became clear that they are real fighters (stupid, clumsy and shortsighted) Mitsurugi could finally fully do what he wanted and not much later he went away from home to see and act in performances so that his experience grew. At the invitation of a major crab Daymo, Mitsurugi goes to The Wall. However, he has a hidden agenda. He gets visits from the spirit of one of the ancestors of his mother. This spirit was a very famous dancer who recognized in him the potential for greatness. She urges him, sometimes very disturbingly, to look for the velvet green fan at an old ruin. This fan belonged to her and possesses magical properties. According to her, these ruins lie in the Shadowlands and Mitsurugi hopes to find them during a Crab excursion. He gets to know the magistrates and experiences his first adventure in the shadowlands, he can’t find the green velvet fan. He and the party beat a evil oni and he personally overcomes a tainted traitor guide in a duel. He leaves his friends to continues to search for the fan because it still haunts his visions. His wanderings bring him in Lion country, the Lion Clan moves to the the winter court in Crane lands, he travels along. During winter court, there are many performances of all kinds. Mitsurugi is taking part in the competition of the no-dancing. He wins this one, which yields much honor to him and his clan. The reward is a beautiful brooch of jade and ivory! He draws the attention of a mysterious host of the Winter court with his great performance. On his way to the party, Mitsurugi is stopped by the lover of the beautiful lady (Moto Isaki of the Unicorn Clan) who challenges him foaming at the mouth to a formal duel. Mitsurugi's honor is only in question if he loses because the woman had not officially been engaged. Naturally, he wins. The samurai in love is defeated but not slain in a marvelous contest of swords. The defeated Bushi and his father now hate Mitsurugi with great vehemence and want him dead. The lady herself asks his hand in marriage but Mitsurigi’s ancestor drives him further on. He arrives in a haunted forest where he is forced to experience a ghost court from a clan that no longer exists. He was pressurized to act as their entertainer. He is able to escape from these spooky festivities with another samurai of the dragon clan, a great flute player who also was forced to act on the spirits behalf. Unfortunately it appeared that this samurai had been too long imprisoned and he fell into ashes when they came out of the woods. Only his magic flute (no joke) remained and Mitsurugi appropriated it as a reward. Mitsurugi resumes looking for his friends despite their total ignorance and vulgarity concerning the beautiful things in existence. They investigate an estate who’s owner is unable to pay his taxes and come to a gruesome discovery. They beat Oni and witches and bring order to it’s affairs. Hereafter their separate their ways again because Mitsurugi is again urged to continue to look for the green velvet fan by his ancestor. He joins a caravan of entertainers where he earns a lot of money with performances. He encounters Moto Isaki again, who followed him and barely escapes death during an ambush from his friends. He challenges Moto Isaki publicly to a duel and wins again with great skill. Unfortunately Kitsu Nadaui meanwhile has sent reinforcements. Under the protection of the local lord he gets out of this predicament but must pay a large sum to a ship's captain. This brings him back to his normal finances. On the ship, he is approached by a monk who entrusts him the diary and some mysterious papers stolen from Moto Isaki. These contain information which allows him to shift the claims from the Lions on Scorpion lands to go to the Unicorn Clan. Apparently Moto Isaki was planning to win Nadaui’s favor by betraying his own clan with the hopes to win the hand of his daughter. Mitsurugi brings this information to light in the court and the deal is denied to the Lion Clan. They succeed in appearing innocent and shift all the blame to Moto Isaki. However, Hamoto is under protection and spirited away to Unicorn Lands. Both he and Nadaui now hate Mitsurugi even more. At the insistence of his haunting grandmother Mitsurugi travels to the edges of civilization in search of the mythical fan. He encounters a group of Dragon samurai who clash with a scouting party of the Scorpions on the edge of the Burning Sands. They overcome the Scorpions but before he dies the oldest of them recognises Mitsurug as being the son of The Red Sting, because he looks like him. 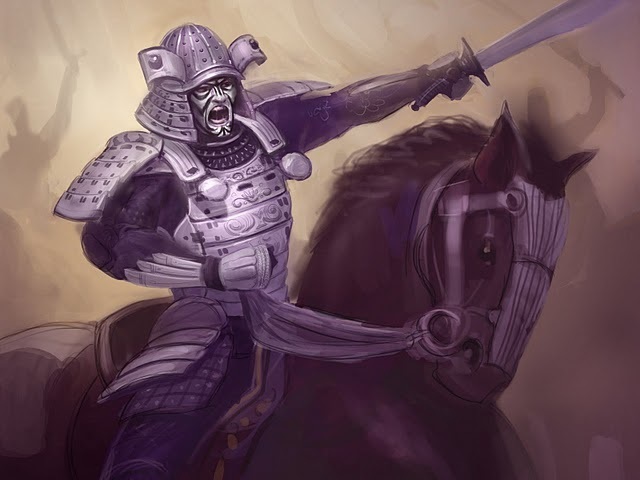 With his dying breath he tells the secret of Mitsurugis origin and the fate of his real father. The Dragons promise to be silent about this because, without Mitsurugi they would have succumbed to the Scorpions attack. Also, there is no evidence annyway. Mitsurugi decides to save his father from the Lions if possible. He claims the "Curved Terror" of the dead Scorpion. This is the bow from his father, who left it with his friend before he went on a mission for the Cranes. On his way to Lion country Mitsurugi meets his friends at the wedding of Toritaka Tatsune.